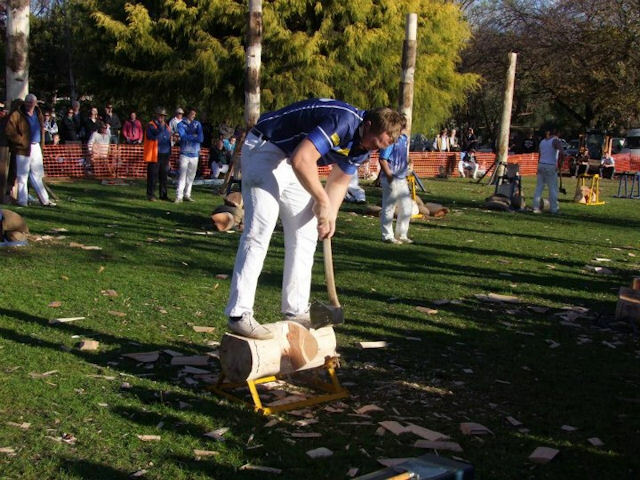 The Woodchop event to be staged at the Alexandra Truck Ute & Rod Show over the Queens Birthday weekend is likely to be the popular end of season event for many of Victoria’s leading axemen. Supported by the Central Victorian Axeman’s Association the event is now rated as one of Victoria’s leading woodchop competitions with significant prize money on offer. To be held on the Sunday of the Queens Birthday weekendÃ‚Â the event has again received significant sponsorship and in kind support from VicForests. VicForests established since 2004 is the State Corporation responsible for the sustainable harvest and sale of timber from Victoria’s State forests. The scheduled events at Alexandra will include all the popular wood chop competitions which draw plenty of interest from the leading male (and female) axe-persons! Prize money will range up to $400 for each event. The ten popular events will include the traditional standing block, underhand log, tree climbing and sawing events. There is also the spectacular and highly competitive three event relay involving both underhand and standing log cutting and tree climbing that has become a unique feature of the Alexandra competition. There are both junior and open events with the junior competition designed to attract emerging young axeman and women under eighteen years of age. Woodchopping is the uniquely Australian sporting event that can trace its origins to about 1870 and has produced many outstanding competitors that have taken on the best of the world with great success. Alexandra is expected to attract the top competitive axemen and women who are expected to be at peak season fitness after the summer months of competition. According to the event co-ordinator, the Alexandra Competition will also help to determine the final points totals for the leading axemen who have competed around the State throughout the season. Enquiries and entries are invited to the Woodchop Competition, Alexandra Truck Ute & Rod Show, PO Box 44 Alexandra 3714 or to Meg Holohan 0400 555 079.